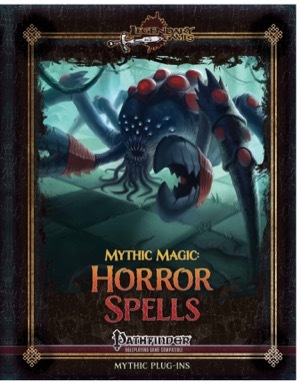 Mythic Magic: Horror Spells is the latest all-new Mythic Magic supplement, bringing you 69 all-new mythic spells from Pathfinder Roleplaying Game Horror Adventures! While the original mythic rules for Pathfinder included many cherished favorites from the Pathfinder Roleplaying Game Core Rulebook as well as the other core rules hardback rulebooks and the Mythic Spell Compendium compiled a vast array of mythic spells for your game, new rules for Pathfinder continue to come out and spellcasters have a continual supply of new tricks to try from more recent rulebooks like Pathfinder Roleplaying Game Horror Adventures. 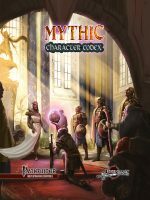 That diversity of options that we love so much about the game is what Legendary Games brings to you in the Mythic Magic series. The product before you completes the mythic rules for every spell in Pathfinder Roleplaying Horror Adventures. All of them, from absurdity to wither limb and all spells in between. Whether you wield arcane, divine, or psychic magic, Mythic Magic: Horror Spells contains mythic spells of every level and every kind, from minor spells to the mightiest magics. You will find combat spells like barbed chain, screaming flames, and waves of blood right alongside defensive magic like ban corruption, impossible angles, and profane nimbus, spells to bring sorrow and despair like mad sultan's melody, dreadscape, and maze of madness and suffering, and of course a huge toolbox of magic designed to tap into the deepest and darkest secrets man was not meant to know, like contact entity, compelling rant, and plundered power! Grab this 26-page Pathfinder supplement by Alex Riggs and Jason Nelson today and Make Your Game Legendary!